"You look like death" is set to become a compliment, as Illamasqua's latest enterprise is to revitalise (so to speak) the trend for open casket funerals. Illamasqua have teamed up with established funeral directors 'Leverton and Sons', to offer "The Final Act of Self-Expression." Illamasqua artists who are up to it, will be specially trained. I had never thought about it, but as the body is dead, not only are all lively natural colours eliminated, but the way makeup is absorbed is utterly different and very tricky indeed. The skin can take on an oily appearance, aside from its grey and weirdly relaxed new guise (yes, the silver lining is that muscles are relaxed so you get that botox effect.) Sometimes, car paint is used, or other rather morbid special makeup which won't need body heat to break it down. Illamasqua apparently will use existing formulas but I am not certain of the details. What is clear though, is that Illamasqua are keen to break away from the old-fashioned, and frankly not glamour or art orientated manifestations of mortuary "feature setting." Generally, the idea of embalming and making up a corpse was, at least initially, simply intended for mimicking (and inevitably failing at) the recreation of a person as they were in life. This interesting video shows actor Richard Wilson's experience at an embalming school. 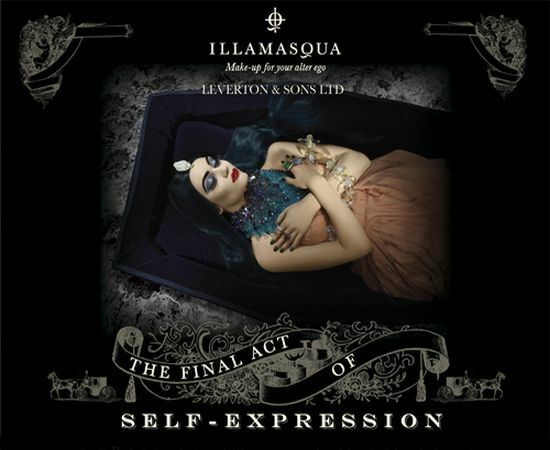 Illamasqua make life easier (or is that, make death easier) by turning the theatrics on. Their promo image depicts a worryingly young victim, with bold red lipstick and bold blue eyeshadow. A somewhat scandalous idealisation of Death. The lady lies defiant in her casket, not a serene sleeping being as of yesteryear's made up bodies: this is a proud and carefully thought out final moment by which the true makeup fan says 'adieu'. Would I have it? I must say no. For one thing, I would not be able to live with the knowledge that once I was dead someone else would be tasked with doing my eyeliner just right - and if they don't, no one will be there to chide them. Illamasqua do offer to go through the look with you in advance, and as such I would have to be best friends with my artists to trust them to that extent! Personally I would never get an open casket, so my views are redundant anyway. I think in US open caskets are more common than in UK. I tend to think death is best kept hidden as far as possible, and the time for flaunting your makeup is in life. But, if you did heaven forbid get snatched away before your makeup stash is emptied (ok so that's all of us) then maybe it would be nice to think it gets one last outing?! ...I am undecided on the concept, what about you? I do think it's a great idea though, and gives the brand yet another edge.